I am enchanted by the colour; golden like the leaves falling outside, bright like the sun and glowing as the moon. This time of year I find myself craving warm drinks, sometimes just to hold a warm mug. I often turn to herbal teas in the evening to remind myself to slow down. I am obsessed with the taste and health benefits of turmeric tea, a vibrant yellow-orange spice. 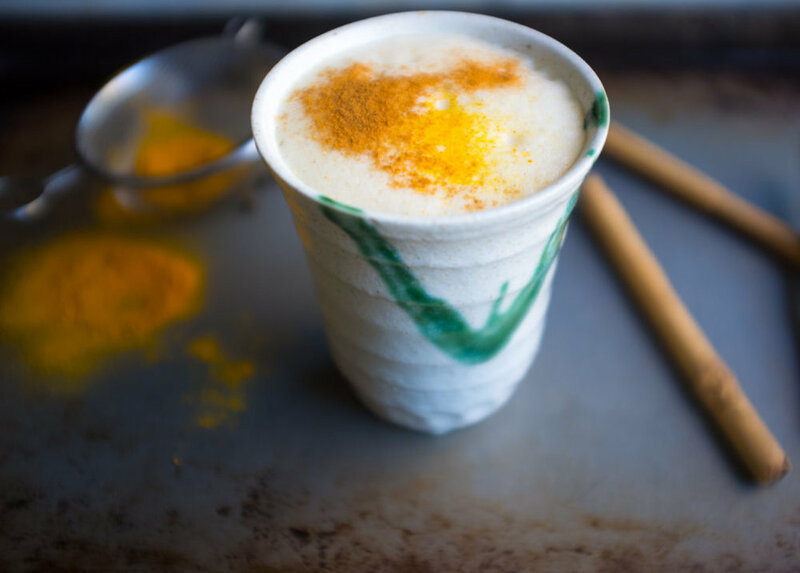 The taste of this tea is similar to Chai, my recipe uses almond milk, but you can use any milk for this recipe. The spicy blend of cinnamon and black pepper is warm and ever so subtle when mixed with the earthy flavour of turmeric. To me, this is the perfect bed-time treat. 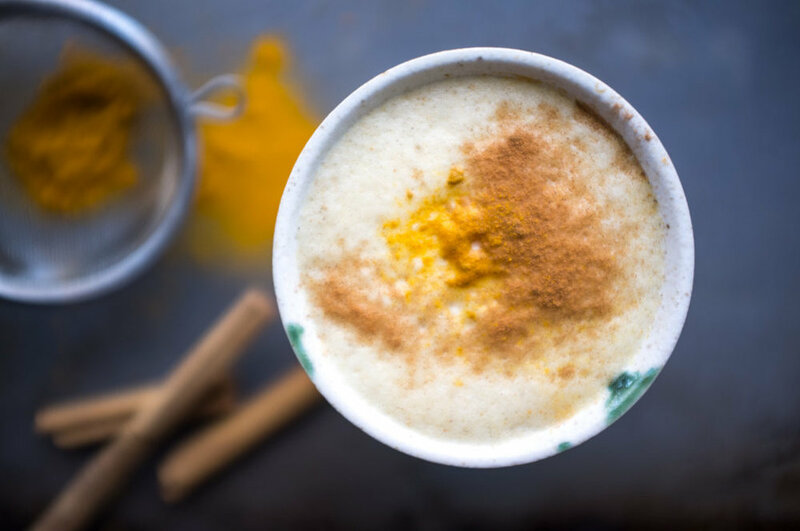 So put on your slippers, simmer a pot of this tea and let the flavours marry to create a beautiful healthy drink that is also a powerful anti-inflammatory, packed with antioxidants. I just love the taste and the beautiful golden hues of yellow and orange. Why add black pepper? It is beneficial to use black pepper with turmeric because it helps the body absorb the spice. Combine milk, cinnamon, turmeric, ginger, nutmeg, honey, peppercorns and 1 cup of water to a medium size pot, bring to a low boil. Turn down the heat and simmer for about 10 minutes. The longer you simmer the tea, the stronger and more intense the tea becomes. To chase away your chocolate craving, try adding a tsp of cocoa powder. I like to use fresh turmeric, but don’t worry if you can’t find it at the store, substitute with dried. This spice stains like crazy — from clothing to countertops — so be careful!